UPDATE: Nike SNKRS has officially confirmed that the Off-White™ x Nike Air Max 97 will launch on October 18. Its retail price remains the same at $190 USD and is also expected to arrive at additional Off-White™ and Nike Sportswear retailers. The next chapter in Off-White™ and Nike‘s partnership has been revealed. We were first introduced to the deconstructed theme via THE TEN’s release back in 2017 which was followed up by a launch commemorating Serena Williams back in August. 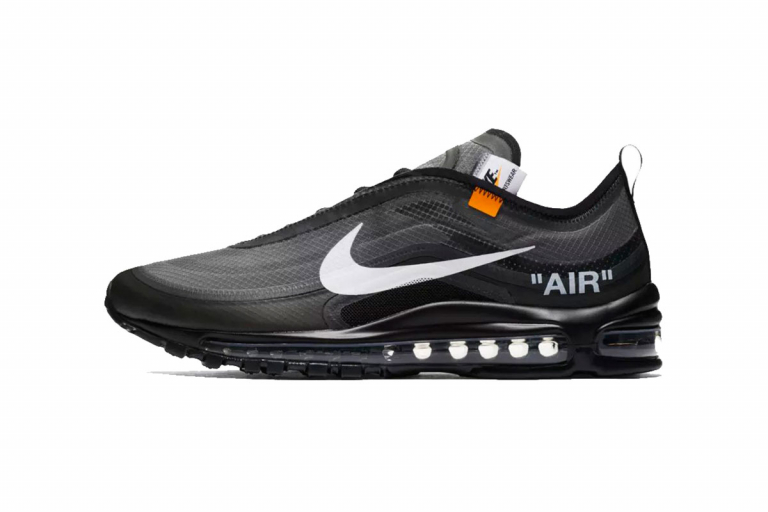 Today, new imagery of the Off-White™ x Nike Air Max 97 in black has surfaced with white contrasting hits of its Swoosh logo, “AIR” stamp on the lateral side and Off-White™ industrial branding on its medial paneling. Each tongue tab also shifts to the outer sides with the insoles embracing the signature Off-White™’ diagonal logo. The Off-White™ x Nike Air Max 97 is geared to hit select retailers and Nike SNKRS soon for $190 USD. Stay tuned for a confirmed launch date and let us know how it compares to previous colorways including the forthcoming “Menta” edition.